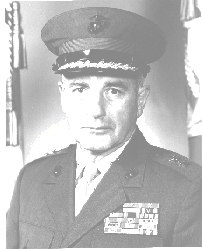 Major General Calhoun J. Killeen retired from the Marine Corps on July 1, 1982. General Killeen was presented the Legion of Merit (Gold Star in lieu of a second award) for exceptionally meritorious conduct in the performance of outstanding service as Deputy Commanding General, FMF, Pacific and as Deputy Commander, Marine Corps Bases, Pacific, from June 1981 to May 1982. General Killeen was born April 7, 1926, in Pittsburgh, Pennsylvania, and graduated from Central Catholic High School there in June 1944. He enlisted in the U.S. Naval Reserve (January 1944), attended Bucknell University in the Navy V-5 Program and terminated his active service to accept an appointment as a midshipman at the U.S. Naval Academy in 1945. He graduated from the Academy in June 1949, earning a B.S. degree in Engineering, and was commissioned a Marine second lieutenant. He also holds an M.S. degree in International Affairs from George Washington University (1972). He completed The Basic School, Marine Corps Schools, Quantico, Va., in June 1950, and served as an instructor and platoon commander there until September 1950, when he was transferred to Marine Corps Recruit Depot, Parris Island, S.C., as Assistant Special Services Officer, Headquarters Battalion. He was promotion to first lieutenant in June 1951. He participated in combat operations in Korea, serving consecutively as a forward observer, battalion liaison officer, battery commanding officer, and S-2 officer with the 3d Battalion, 11th Marines, 1st Marine Division. He was awarded the Bronze Star Medal for his service in Korea. Returning to the United States in April 1953, General Killeen served as Commanding Officer, Company I, 3d Battalion, 2d Marines, 2d Marine Division, Camp Lejeune, N.C., until the following December, when he was reassigned as a battery commander, and S-3 Officer, 1st Battalion, 10th Marines, also at Camp Lejeune. He was promoted to captain in July 1953. From July 1955 to August 1958, General Killeen served as a math instructor at the U.S. Naval Academy. He attended the Amphibious Warfare School, Quantico, completing the course in June 1959. Following his promotion to major, he was ordered to Okinawa where he served successively as Assistant S-3 Officer and Assistant Fire Support Coordinator, 12th Marines, and S-3 Officer and Executive Officer with the 4th Battalion, 12th Marines, 3d Marine Division. He returned to the U.S. in October 1960, and was assigned as Assistant Fire Support Coordinator, 11th Marines, and later, as S-3, Executive Officer and Commanding Officer, 2d Battalion, 11th Marines and G-3 Plans Officer, 1st Marine Division, Camp Pendleton, Calif.
From April to September 1963, he attended the U.S. Defense Intelligence School, Washington, D.C., and the Sanz Language School, where he studied Danish. In October 1963, he was ordered to Copenhagen, Denmark, as Assistant Naval Attache. He was promoted to lieutenant colonel in August 1965. General Killeen reported to the Alternate National Military Command Center, Fort Richie, Md., in July 1966, and served as an Operations Team Intelligence Chief until July 1968, when he was ordered to South Vietnam serving as Executive Officer, 12th Marines, and later, as Commanding Officer, 2d Battalion, 12th Marines, 3d Marine Division. He was awarded the Legion of Merit with Combat "V", the Navy Commendation Medal with Combat "V", the Combat Action Ribbon, and the Republic of Vietnam Cross of Gallantry with silver star for his Vietnam service. He was transferred to Headquarters Marine Corps, Washington, D.C., in October 1969, as Head, Plans and Programs Branch, G-3 Division, where he was awarded the Meritorious Service Medal. He was promoted to colonel in February 1970.
kinawa, Japan. He assumed duty as Deputy Commander, FMF, Pacific, Camp H. M. Smith, Hawaii in June 1981. General Killeen served in this capacity until his retirement on July 1, 1982. General Killeen's medals and decorations include the Legion of Merit with Combat"V", Bronze Star Medal with Combat "V", Meritorious Service Medal, Navy Commendation Medal with Combat "V", Combat Action Ribbon, Navy Unit Commendation, American Campaign Medal, World War II Victory Medal, National Defense Service Medal with one star, Korean Service Medal with three bronze stars, Republic of Vietnam Service Medal with four bronze stars, Republic of Vietnam Service with silver star, Republic of Vietnam Meritorious Unit Citation Gallantry Cross with palm, United Nations Service Medal and the Republic of Vietnam Campaign Medal. Calhoun J. Killeen, 75, a McLean resident who served in the Marine Corps for 33 years before retiring as a Major General and Deputy Commander of the Pacific Fleet Marine Force, died June 27, 2001, at Sleepy Hollow Manor Nursing Home in Annandale, Virginia. He had a heart ailment. He served in Korea with the 1st Marine Division during the Korean War and in Vietnam during the war there. Other assignments included tours as an assistant naval attaché in Denmark and as a mathematics instructor at the U.S. Naval Academy at Annapolis. In the 1970s, he served as the Marine Corps' inspector general and as commanding general of the 3rd Marine Division in Okinawa. After retiring from active duty, General Killeen founded Killeen Enterprises, a McLean defense consulting firm, which he operated until retiring in 1992. He had done consulting work for Kapos Associates Inc. in Arlington and the American Systems Corp. in Chantilly. He also had served on the board of Radiation Systems Inc. of Sterling. General Killeen's military decorations included the Legion of Merit with combat "v" and a gold star in lieu of a second award, and the Bronze Star with combat "v."
He was a co-founder of the annual Washington Marine Corps Scholarship Foundation Ball and had served on the boards of the Marine Corps Scholarship Foundation, the National Capital Chapter of the American Red Cross and the Marine Corps Association. His memberships included St. Luke's Catholic Church in McLean, the Army Navy Country Club, the Society of Virginia, the McLean Civitans and the Marine Corps Historical Foundation. General Killeen, a Pittsburgh native, was a 1949 graduate of the U.S. Naval Academy, where he was a baseball varsity first baseman and football varsity quarterback. He also was a graduate of the Naval War College in Newport, Rhode Island. His first wife, the former Mary Margaret White, died in 1976. Survivors include his wife of 23 years, Jo Ann Cooper Killeen of McLean; three children by his first marriage, Calhoun John Killeen Jr. of West Newbury, Mass., Kevin Joseph Killeen of Orange, Conn., and Amy Marie Killeen of Walkersville; three stepchildren, Kelly Cook Imhof of Lexington Park and retired Air Force Tech Sgt. Steven W. Sherrod and Carla Sherrod Sutherland, both of Goldsboro, N.C.; two brothers; seven grandchildren; and five stepgrandchildren. Calhoun J. Killeen, a Pittsburgh native who spent 33 years in the Marine Corps and rose to the rank of Major General, died June 27, 2001, in a nursing home in Annandale, Virginia. General Killeen, who was 75, had a heart ailment. He served in the Korean and Vietnam wars, earning numerous decorations for valor, and held a variety of leadership positions in peacetime. In the late 1970s, General Killeen was Inspector General of the Marine Corps and Commanding General of the 3rd Marine Division in Okinawa. He also taught math at the U.S. Naval Academy. General Killeen retired from military service in 1982 as Deputy Commander of the Pacific Fleet Marine Force. Born in Pittsburgh, he attended Central Catholic High School. He is a member of that school's hall of fame. After graduating in 1944, he enlisted in the U.S. Naval Reserve and enrolled at Bucknell University. He received an appointment to the Naval Academy the following year. He played quarterback for the football team at Annapolis, and was a first baseman on the baseball team. He graduated in 1949 with a bachelor's degree in engineering and was commissioned as a Marine Second Lieutenant. His first wife, Mary, died in 1976. He and his second wife, Jo Ann Cooper Killeen, settled in McLean, Va., after he retired from the Marines. Because of his heart ailment and other health problems, he had lived for the past four years in a nursing home. A funeral service will be held July 25 in Fort Myer, Virginia. General Killeen will be buried in Arlington National Cemetery.